FSU Art BFA ’94 Paul Joachim placed as one of three finalists in the 2017 Golden Tier Awards, presented by American Cake Decorating magazine and Lisa Mansour of NY Cake. The Golden Tier Awards is the first American-hosted, international awards show of its kind. This exclusive event brings together pastry chefs, cake and sugar-artists, dessert professionals, authors and writers, chocolatiers, instructors, and retailers to celebrate the very best the industry has to offer. Known as The Chocolate Genius, Paul Joachim is the world’s only chocolate speed sculptor. He has turned his passion for luxurious chocolate and sculpting into innovative live entertainment at high profile events. 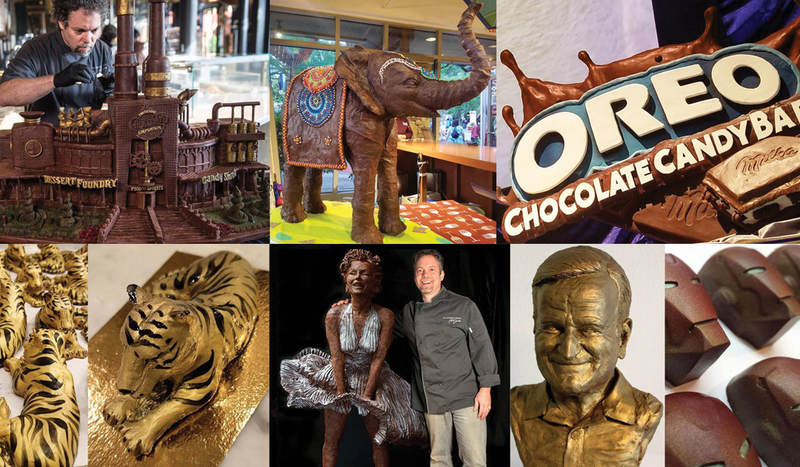 His remarkable chocolate art has been featured on CBS’ The Talk, Food Network, The Today Show Australia, A&E and Hallmark Channel along with the National Enquirer, The Wall Street Journal, Fox News and countless others. As a Food Network Challenge winner, Paul has sculpted everything from a life-size LeBron James, to horses, to giant track shoes. His incredible speed combined with the artistic beauty of his sculptures sets him apart. A masterful life-size chocolate bust can be completed in as little as 30 minutes, turning his art into high energy, live entertainment. Furthermore, Paul takes the experience to another level by mesmerizing audiences with exhilarating chocolate tastings and engaging stories as he sculpts at museums, Fortune 50 events and ultra-high-net-worth private occasions worldwide.